Yeeaaa, no, I don't need one of these eavesdropping devices in my home. I am intelligent enough to turn on a light via a switch. Slippy, Mad Trapper, stevekozak and 1 others like this. If you have a phone connected to the internet you are F'd! It doesn't matter everything is tracking you. Every app that you download owns you. At one point I had a flashlight app that would spontaneously turn on. It was searching for video after I looked it up. The app came with my phone!! We live in a time where it's all or nothing. You either have apps and a smart phone or you don't. Don't be surprised when they know where you took your last shat!! So why did you download those apps? Need to do $#!t besides make a call? Not if my phone is off all the time.....besides making a call. But I've still got a "dumb phone", lucky me! I'm going to tell you I have 5 Alexa's all through my house and shop. I love having them they are a tool just like anything else nowadays. If you think your cell phone is benign or the Laptop or Smart TV. You are just fooling yourself. If it has digital two way communication it probably has the ability to spy on you and there is nothing you can do about it. I doubt it. Unless you are stupid and leave the barn door open. I've sold my soul to the devil. I know what I did. There are a lot of stupid people out there that have no idea. I could never give up my bingo and candy crush. I have Siri. Looks like it works the same way. Sasquatch and modfan like this. SGG, stevekozak and bigwheel like this. 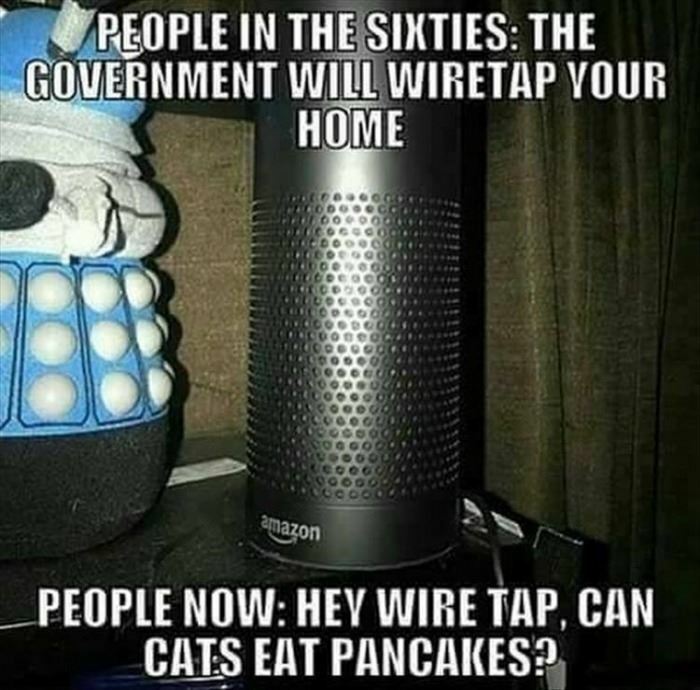 If the gubmint or anyone else is listening to me from my Alexa they must be pretty bored. Since I live alone I don't do a lot of talking. I suppose if they REALLY wanted to know what I buy online and keep track of it they could just follow my computer habits. Good thing none of you have one of those pesky computers. modfan and bigwheel like this.